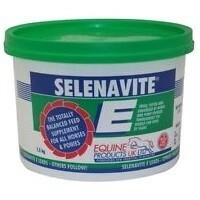 Selenavite E Equine Supplement Powder was initially produced as a veterinary only product to meet the specific requirements of an equine orientated practice, specialising in the performance horse. In the late 70's there were a number of publications on the relationship between Vitamin E and various muscle related problems. Working with racehorses they saw a large number with an inability to quicken in the last furlongs of a race. A blood-sampling programme was initiated and showed a high percentage of raised CPK levels, i.e. muscle damage. Selenavite E Equine Supplement Powder fed daily helps to provide supplementary amounts of some 22 micro nutrients, including trace elements, vitamins and amino acids to give horses added performance in the final strides. There is no better way to assist the ongoing health, wellbeing and good condition of your horse or pony.